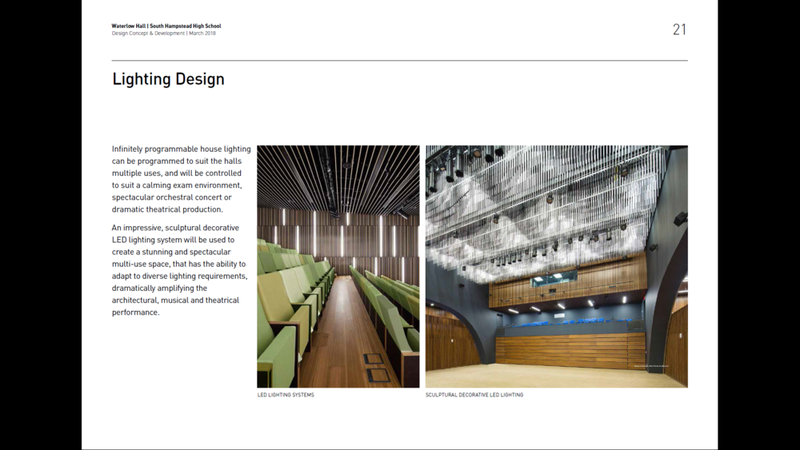 The ceiling of the new hall will be made up of 2480 LED lights. We are delighted that Stage 2 of the re-development is now complete and the Hall is back in action for this year. We were delighted to recognise two parents who have given huge support to the Waterlow Hall campaign with the presentation of a South Hampstead penguin. Our penguins were commissioned from the Belgian artist William Sweetlove to celebrate the completion and opening of the senior school building in 2014. The colony of life-size blue and gold penguins, dotted throughout the school, has been providing an injection of colour and humour ever since, even inspiring the name of our student magazine. The artist chose the penguin, complete with water-bottle backpack, to typify the school’s somewhat quirky and irreverent outlook. Our pupils, just like penguins, are quick, resilient and highly social; eager to dive in, and displaying excellent vision in choppy water, each has their own distinct call. As one of the few species where males and females share the chick-rearing, penguins possess an egalitarian outlook which resonates well at South Hampstead. Interestingly, penguins have more feathers than the average bird. As part of the commission, the artist moulded a number of smaller, limited-edition replicas of the original sculptures. These are proudly presented to members of our community who have made a significant and important contribution to the school. If you are new to South Hampstead or just haven’t had a chance to see our exciting plans for the Waterlow Hall come and ‘drop in’ this Wednesday morning. The plans, film and model will be on display in the current Waterlow Hall at the Senior School from 8.00am until 9.00am and anyone is welcome. It is also a great opportunity to see what we have done so far. For more information contact development@shhs.gdst.net or visit our events page. We are delighted to let you know that as of today, over £1 million has been pledged and raised towards the Waterlow Hall development. This is a huge achievement and comes on the very day that the Hall re-opens after the completion of the stage 2 works. We hope that everyone will get involved with the fundraising for the Waterlow Hall and our new film is a fabulous example of a collaborative effort. So many thanks must go to current parent Amy Gelber who masterminded the whole thing. She is our #WaterlowHero this week. Over the summer, several Alumnae got in touch to find out more about the Waterlow Hall project having read about it in our alumnae magazine 'Resplendens'. 'It is wonderful, and surprising, how easy it has turned out to be to take part in this project which is so close to my heart - my heart as a student, with fond memories of directing our class entry in the drama competition ("Noah" by Andre Obey Act 1) and enjoying the small role of Polixenes in the school play of the "Winter's Tale." Every two months we send out a newsletter to those who are already involved and committed to the Waterlow Hall Campaign. If you would like to receive the update then please email development@shhs.gdst.net or click on the link below. Despina Tsatsas (2000) recently joined the Young Vic theatre as Executive Director and has agreed to be one of our Campaign Ambassadors for the Waterlow Hall. To find out what she has to say about the importance of theatre visit the Ambassadors page. Take a quick look at what is happening to the Waterlow Hall this holiday. The yellow planning applications are up outside the school and the Hall has been stripped in preparation for stage 2 of the works. It will reopen in October for the rest of the school year ready for the final transformation in July 2019 if we can raise the £3 million needed. 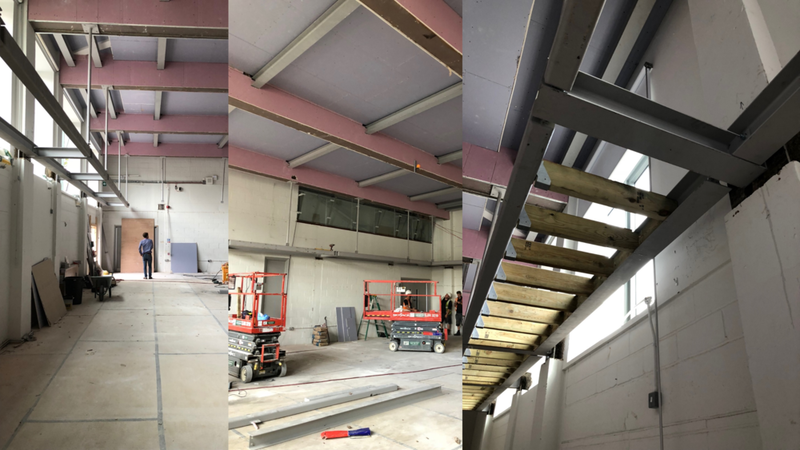 Erection of plant equipment, plant screen & associated ductwork to Waterlow Hall main roof and lower roof including the reinstatement of existing photo-voltaic panels above new ductwork runs & relocation of existing photo-voltaic panels to Maresfield building roof. The latest edition of the alumnae magazine Resplendens is out and features a family who have been educated at South Hampstead for over a century. We are delighted that Ruth Levy (1957) and Joan Arnold (1966) have not just been part of this great South Hampstead legacy but have also chosen to support the Waterlow Hall Campaign in memory of their mother Betty Arnold (nee Hailey) who attended the school from 1915 - 1920). Thank you. More than 100 people took a journey inside the Waterlow Hall plans yesterday as we revealed the Virtual Reality model of the proposed transformation. Huge thanks must go to Matt Lade who designed and set up the model and to Jessica Learmond-Criqui who made it all possible. We hope to have another viewing for girls in the senior school in the autumn so look out for details. We are completely reliant on the support of our whole community to realise our vision for Waterlow Hall. People have been incredibly generous already with their time, energy and money. This week's #WaterlowHero is Miss Wrigglesworth (Design and Technology) who has put together some fabulous artwork for our display banners in double quick time. HAVE YOU SEEN THE MODEL? First view of our Virtual Reality model last night. We can't wait to show the junior school girls on Monday at the Open Day. Come and find us in the Marquee and 'step into' the transformed Waterlow Hall with us. Amazing! Thank you so much to Matt (the designer) Jessica Learmond-Criqui and Ariel who tried it out for us.